Better Finishes! Less Work with Granite Dust Premium Fishing Lure Coating! The All-Canada Show is Here! The All-Canada Show, an indispensable tool for outdoor lovers planning their next adventure to Canada. It is a multifaceted site displaying a multitude of lodges and camps in in the great north and details the upcoming schedule of the traveling All-Canada Show. The site features an easy to use map navigation to hone in on hundreds of lodges around the great Canadian outback; complete with links to the sites and pricing. In addition, the All-Canada Show travels the country for a face-to-face opportunity for outdoor enthusiasts to meet with a variety of lodge owners and talk details of fishing, wild game and amenities. 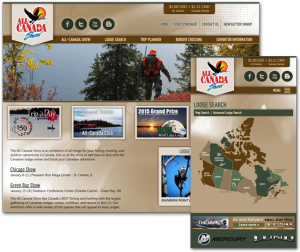 In addition, www.allcanada.com is a responsive website designed to load quickly and presentable on all devices, All-Canada will recognize the device it’s being viewed on (PC, tablet, smart phone, etc.) and will employ different elements of it’s programming to ensure the interactive experience is enjoyable.